Tomorrow I'll be getting together with friends and taking part in the 2nd of 4 YouTube Video Parties put on by FSJ called RGPresents. I've got my bundle in hand (has stamp sets, paper, card kits, and directions) that I purchased early last month and supplies that I need to make the cards (inks, Silks, adhesives, etc.). At our March Party we decided to do a card front swap using stamps we used that day or were showcased and I got mine done! Whoo Hoo! I used a variety of products. When I showed this to my hubby he was impressed with the number of layers. I seen a layout that inspired this card and loved how it all came together. I started with a base of Hazelnut Blend card stock. 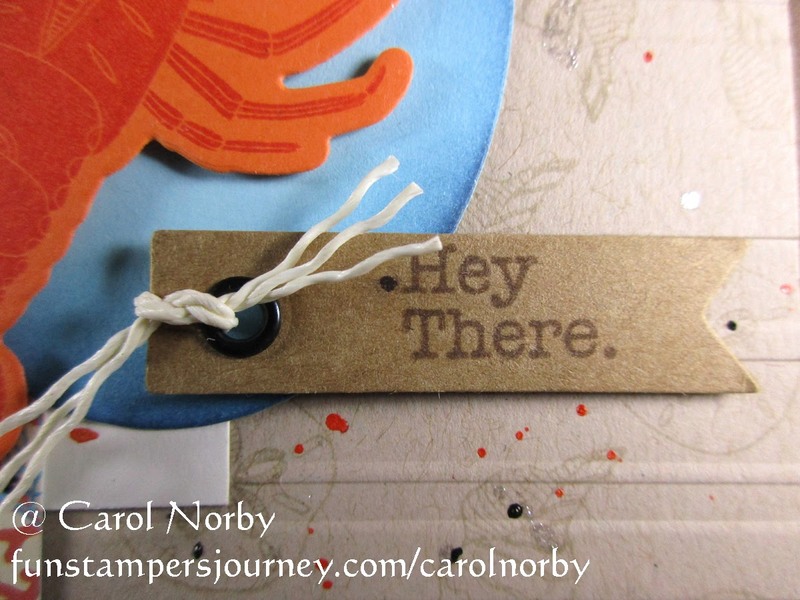 I stamped the Oatmeal Cookie layer with the shell and sand dollar from the Sandy Toes stamp set using Oatmeal Cookie ink for a subtle background. I then embossed this with our Beach Towel embossing folder. 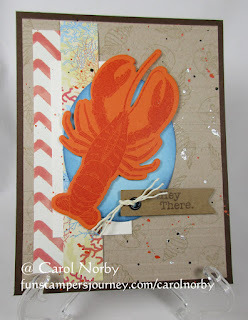 I added strips from our Under The Sea Prints and a piece of Butter Cream card stock to the left side. To finish the base I splattered 3 different Silks, Sparkle, Dark Roast, and Citrus Cooler. I let these dry while I worked on the focal point since the Dark Roast Silk takes a bit of time to dry. And the Sparkle Silk, oh my gosh is it gorgeous! I used my Journey Oval dies to make the Pool Play oval. Using my new large Dauber Dowel and a Pad I added some Hazelnut Blend ink to the edge of the oval and adhered to my base. 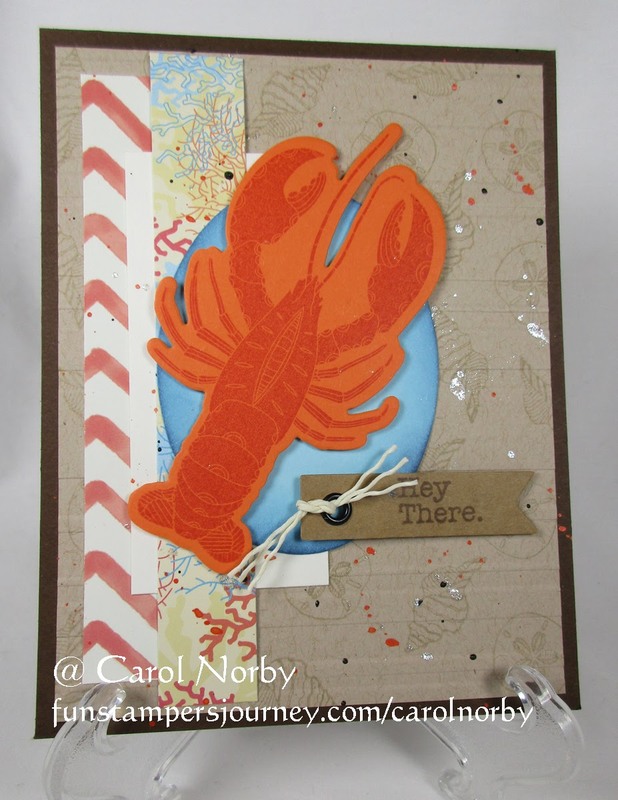 I stamped a piece of Citrus Cooler card stock with the Pinch Love ATS lobster using Rich Coral ink and die cut. The cute little tag is a Bloom Benefit you can get FREE with a $50+ order called Tag It. 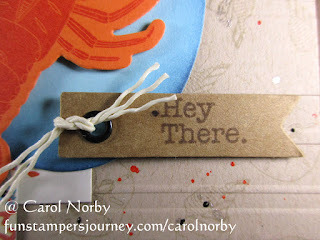 I stamped the phrase from our Hello Pelican ATS using Hazelnut Blend ink and added another Bloom Benefit, Twill Rope, to the tag. Here's a closer look at the tag. I untwisted the Rope after tying it on the tag. Didn't this turn out great! I love how well the colors work together. I'm sure my card fronts will be a hit!